Learn how to increase your visibility and profitability in a cluttered marketplace. 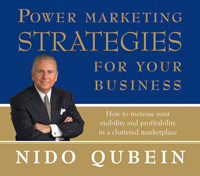 In this recently recorded CD program, Nido Qubein outlines the strategic objectives you need to focus your creative energies for long-term business growth. Marketing productivity directly relates to sales, which underscores the necessity of an outstanding promotional plan. Your unique differential advantage can help you achieve greater strength by creating a niche for your business in the market. Highlighting your specialized expertise can not only increase sales, but grow your reputation among customers. Why Should People Buy What You Have to Sell?